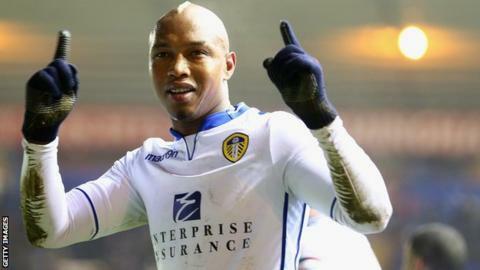 Millwall are "appalled" by footage showing their supporters aiming racial abuse at Leeds striker El Hadji Diouf. The pictures, showing Senegal international Diouf being abused appeared on Sky Sports News. "Like all Millwall fans and football fans generally, we're appalled by the footage we've seen," said Lions chief executive Andy Ambler. "Clearly that behaviour is unacceptable in any football ground in the country." Ambler added: "Sadly racism exists in our society and certain individuals want to bring it into football grounds. It's down to us in football to do more. "That day against Leeds obviously there was an allegation of abuse made online initially. We investigated it straight away. "We interviewed stewards, police, players, we looked at the TV footage too as it was live on Sky. "After speaking to the player [Diouf] who had the alleged abuse at him during the day, he said that he heard no abuse so that was basically at that point the end of the investigation - although we're going to open it again now." Sports Minister Hugh Robertson added: "While we have come a long way in tackling racism in football over the last 20 years, this is not a battle that has been won." Bolton and England Under-21 striker Marvin Sordell also previously made allegations of racial abuse towards Millwall's fans. After doing so, a banner further abusing the 21-year-old was displayed at The Den and a 13-year-old boy was banned from the ground. Football Association chairman David Bernstein told the Sky Sports special report he is treating allegations with the utmost importance. "These issues bother me intensely," he said. "They have become top of my agenda in terms of moving these things on and combating these things. "The awareness of it could not be higher." Football League chairman Greg Clarke added: "There's two issues. One is we have to continue to work with the clubs on our anti-racism programmes which are agreed with the FA. "Secondly is the reticence of black players to come forward and feel comfortable in supporting it. "If we've created an environment that doesn't support black players in confronting this issue we've done something terribly wrong."